Will South Africa doctor the Cape Town pitch? Will South Africa back their pace attack to do more damage than Australia’s and ask for a lively pitch in the deciding Test at Cape Town starting Saturday? Or will the often pace-friendly Newlands deck be more placid than normal in light of Australia’s struggles on the dull surface at Port Elizabeth? With the series on the line in this third Test, it is hard to imagine the South African camp will not have a say in the condition of the surface. The curator at St George’s Park, Adrian Carter, said days out from the second Test how he prepared the deck would depend on what Proteas’ skipper Graeme Smith and coach Russell Domingo said. That is the claim of Australian skipper Michael Clarke, who said Carter had made this admission to him during a conversation. It was not part of a sinister plot to foil the Australians and their rampant quick Mitchell Johnson, it was merely the home side exercising the advantage of being hosts. Every Test side does it, although to varying degrees. What then, can we expect at Newlands? The Proteas will undoubtedly want a surface which will produce a result. They will be desperate to overcome their hoodoo against Australia, who they have not defeated at home in a Test series for more than 40 years. Normally a ‘result’ pitch is interpreted as one which will offer generous assistance to the bowlers. However, the potency of the attacks boasted by both sides suggests a draw is unlikely, even on a benign surface; neither of the first two Tests made it past the fourth day. The last time these sides crossed paths at Newlands, the Test was completed before lunch on the third day. The pitch was so helpful to the quicks it is easy to forget South Africa were dismissed for a paltry 96 in their first innings. Whenever cricket followers reminisce over this Test, the first number that rolls of their tongue is 47 – Australia’s second innings total. During one period on day two of that match, the sides combined lost 19-94. The following summer, when Sri Lanka visited, the pitch at Cape Town was unrecognisable. Devoid of the thick grass cover seen during the 2011 debacle, it allowed 1063 runs to be scored for the loss of only 24 wickets. Then in February last year, a sporting deck greeted Pakistan who managed to compete strongly with South Africa before losing in a tight, four-wicket result. My guess is the Newlands deck for this week’s Test will look nothing like its 2011 incarnation. South Africa may have bulldozed Australia at St George’s Park, but they will remain wary of the carnage the tourists’ quicks could engineer on a green seamer. Granted, South Africa’s pacemen would perhaps create even more destruction on a responsive pitch. However, Test sides are now well aware that Australia are at their most vulnerable on surfaces which do not offer pace and bounce. 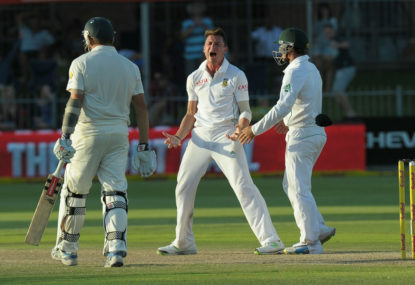 While Australia’s attack has had success – Port Elizabeth aside – on low, slow decks, their batsmen often lack the patience required to prosper in such conditions. The South African batsmen do not, as we witnessed the past week. If the Proteas are crafty they will request the Newlands’s deck offers Australia the least possible assistance in their quest to secure a 2-1 series win.